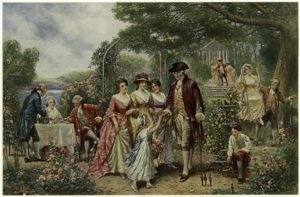 George Washington strolling in a garden with family and friends. Modern American society promises to make life so much easier. No longer do most people have to labor long and hard to make ends meet. Americans should have plenty of time to enjoy their leisure. But many don’t take this time. They have a problem with leisure. According to a report commissioned by Project: Time Off, the average American takes less than 17 days of vacation per year. Some 54 percent don’t even take these days off. They are working 662 million more days than they are required. Nearly a third of these days (206 million) cannot be cashed out and are therefore forfeited, which means people are working for free. The situation becomes worse when considering that two-thirds of those who do go on vacation take work with them. Others keep up with or are expected to know what is happening at work by checking online. Bosses often feel free to call vacationing employees to resolve problems. People are cyber-tethered to their jobs. As a result, people experience high levels of stress and anxiety. It suggests that people do not understand or know how to enjoy leisure. The solution to the problem is a Catholic understanding of leisure. Most people today see it as a time of rest, fun or idleness. It can represent a respite between periods of work or an escape from the hectic schedules that rule people’s lives. However, leisure is something much more profound. In his famous book, Leisure, the Basis of Culture, Pieper defines it as a celebration of the end of a period of work that allows the “inner eye to dwell for a while upon the reality of Creation.” It is an activity full of reflection, repose and poetry favoring the development of the arts and the worship of God. One of the great tragedies of the Industrial Revolution was its destruction of leisure. It created in its stead mechanized and standardized recreation. The gawking tourist was born in which the person valued how many things were seen in a given amount of time. Pastimes became dominated by speed, noise and lack of reflection. Such a materialistic perspective reduces the joys of life to eating, drinking, and consuming. Such activities may satisfy the material needs of people in unimaginable ways. The world is full of casinos, amusement parks and cruise ships. 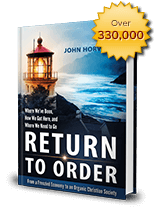 However, they fail to address urgent spiritual desires that seek after the good, true and beautiful, and ultimately, God. They cause immense frustration and sadness since this frenzied vision of life cannot satisfy the search for meaning demanded by human nature. Thus, postmodern man is left adrift without focus or purpose, always in search of the next great sensation, entertainment or fad. Someone might object that people today are still better off than those in times past. Materially speaking, this is undoubtedly true. Whatever one might think about pre-modern times, people back then had much more leisure. They worked extremely hard, but they also practiced leisure with great intensity. The distinctions between work and leisure were clearly marked. Leisure was focused above all on spiritual things. The medieval calendar, for example, was filled with holy days and seasonal work schedules that allowed ample time—often as much as half the year—for leisure, celebration, and worship that foster the whole development of man. Boston College professor Juliet B. Schor reports average work years of 120 days for medieval peasants, 175 days for servile laborers, and 180 days for farmer-miners. The rich folklore of times past is full of poetry, music and distinctive clothing. It testifies to an intense cultural life cultivated in the leisure of the common people. To compare leisure present and past, consider modern partying and the festival. These two celebrations reflect two different mentalities. Partying involves a collection of individuals that need not have a close relationship. It need not focus on a particular event or accomplishment. People are attracted to partying since it addresses man’s instinct of sociability in a world of lonely individualism. However, partying often has a note of overindulgence and superficiality. Far from quelling the anxieties of souls, it is often only a brief escape from them. Thus, partying does not resolve what Robert Nisbet refers to as the person’s unquenchable quest for community. The festival invites people to transcend the workaday world and satisfy the spiritual longings that are so much a part of human nature. Quoting Karl Kerenyi, Pieper claims that the festival represents “the union of tranquility, contemplation, and intensity of life.” It is not by coincidence that festivals often had a religious significance since a search for the meaningfulness of Creation will always lead to God its Creator. This celebration often finds its highest expression in Catholic liturgy. That is why feasts and festivals abounded in medieval times. In fact, many refer to the Middle Ages as the “golden age of feasts” since one naturally imagines grand feasts in this context. Such events were full of pageantry, poetry and splendor and involved significant numbers of people from all social levels. True to their Christian roots, public feasts often included the poor and needy … served by Christian kings. What is missing in today’s society is true leisure. People need to take the time to stop and contemplate together “the meaningfulness of the universe.” There needs to be a willingness to transcend beyond self to consider how to restore the lost unity that is tearing the nation apart. People are so self-absorbed with the world of work and pleasure that they don’t know how to take a vacation, celebrate life’s meaning or return to God. Until an awakening to leisure happens, the division and polarization will only become worse as personal interests proliferate. There are many problems facing the nation. There are calls for more jobs, better education and improved healthcare. All these things are important. However, true leisure is especially needed if the nation is to survive and return to God. The noise of today’s party economy needs to stop. People must take the leisure to find ways to celebrate joyfully together what it means to be an American in these troubled times.